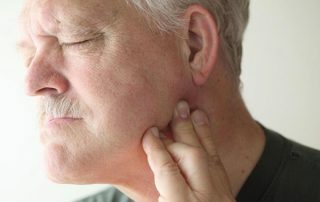 Temporomandibular joint aka TMJ is pain in and around the ear where the mandible attaches to the skull. The temporomandibular (TMJ) joint allows you to open and close your mouth for chewing, talking and yawning. Dysfunction of this joint causes jaw pain, headaches, swelling, numbness, radiating pain, stiffness, jaw locking, clicking and popping. Temporomandibular Joint Dysfunction. (2017, January 2).